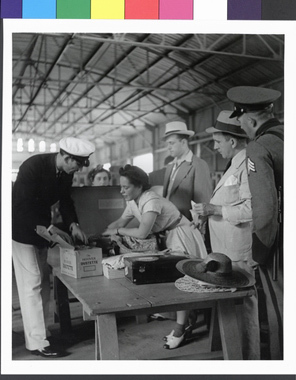 JDC - Archives : Customs inspection in Ciudad Trujillo after the arrival of new settlers. Title Customs inspection in Ciudad Trujillo after the arrival of new settlers. Description Newly arrived settlers in the Ciudad Trujillo port present their belongings to the customs officials for inspection.